At first people thought this was a spoof, until the government confirmed even the cynics worst fears: that it was real. Considered as offensive to a large cohort of the population, the political opposition embraced this as their silver bullet in a campaign to brand the present government as out of touch with the people. But what was this advert trying to do? Let us brush aside the rights and wrongs of political swings for a moment. 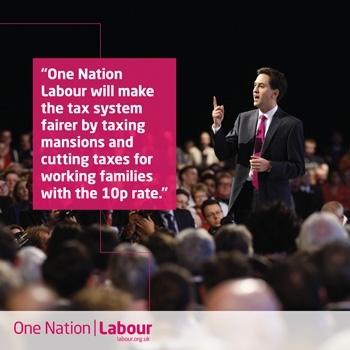 This ad is hoping to address working families. If we consider working families as a reference group, the hope is that they will see that the government understands them and is directly influencing their lives for the better. If they feel this way, and recognise that it is a conservative government doing that, hopefully their loyalty to the conservative ‘brand’ will grow. Labour unions and political parties do this all the time, however usually they are more successful at identifying a common denominator in a reference group. As it is, it conveys the high society Tories looking down on Mr and Mrs Serf and granting them a few extra liberties down on the bottom rung of the British caste system. In addition however, I look at it and think it is very overgeneralising of a group of people in society – a point that no one else seems to have mentioned. 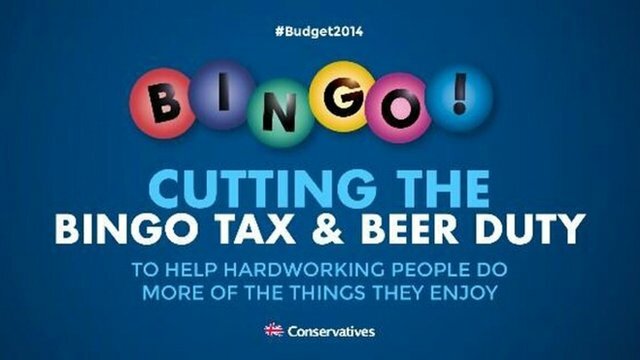 Should it have worked had the conservative party decided to identify with their electorate? Escalas & Bettman (2005) argue that individuals, to construct their self-concepts, use brands associated with reference groups. When the advert conveys an image that is congruent to the image on an in-group, consumers start to bond with the brand. There is more to reference group advertising however, than just appealing to an individuals group membership to create a brand connection. Part of the utility of a product or service is what it does for your standing in the group. Bearden and Etzel (1982) demonstrate that there is more leverage from the factors influencing brands that are publicly consumed. Simply put, decisions (either for or against) are made more sensitively when it affects ones image or standing in a reference group. This can be either good or bad, depending on what the product or reference group is, but the principle is that the involvement of reference groups can make factors contributing to success of the ad a lot more volatile. To bring it back to the conservative party’s advert, if the reference group is offended, people will consider their loyalty to the conservative party in light of their self image. Even before the bad press, the advert has done its sponsor a disservice. Use of the word ‘they’ over ‘we’ has also separated the public from bonding with the brand, meaning that the wrong use of a tiny (almost meaningless word), and maybe some overgeneralisation, makes this a bad ad. I got to experience essay writing from a different perspective this week. I have been producing a critical analysis of psychoanalytic therapy, and to my dismay, it seemed that all the journal articles that had relevant abstracts were stuck behind a firewall of some overseas journal. 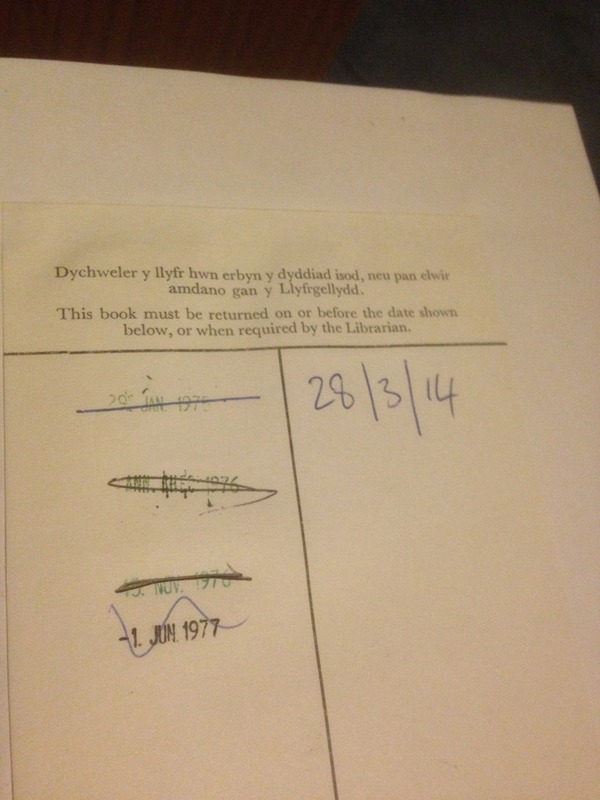 A couple of those were still available however in the Bangor University library archives, and, sure enough, after a couple of days the porter was able to fetch me them. It is really thought provoking to realise that once upon a time, this was how research was done. 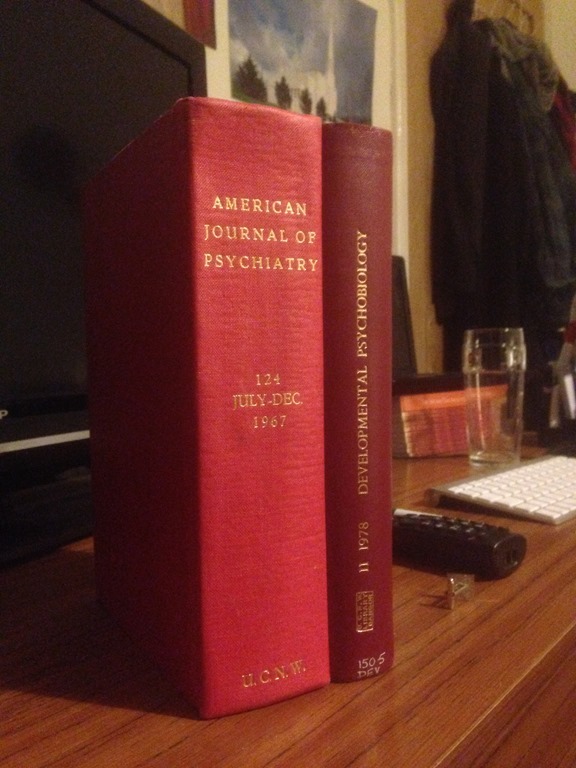 When I opened the 124th volume of the American Journal of Psychiatry, I saw that it had last been drawn out on June 1st 1977. That was nearly 40 years ago! To literally turn the pages of history, the contrast between the research then and now shows the advancements which have taken place over the years. One article referred to the success of a hospital ship in treating psychiatric patients from the Vietnam war, for which the authors carried military credentials. How incredible it is now that we live in an age of information abundance, where we can search all the journals of the world in a matter of seconds. How astounding that the problem we have now is that there is too much information to know what to do with? How quickly does the amount of information in the world double? Or how soon does its half life take hold? I can’t imagine what it would have been like living 40 years ago in a paper journal and type-writer world. I wonder if it was actually quite therapeutic; perhaps a more mindful experience? Back when the boundaries of having completely searched ‘everything’ could be met once you had skewered through the indexes of the library. Yet this was a time when so many of the fundamentals of psychology were being established. Beck’s inventory, behaviourism, the magic seven, plus or minus two, and Anna Freud to name a few. What is the best way to utilise the tools we have now? That we might not loose the forest in the trees. I’m going to stray away from business use of television advertising and look at other ventures’ use of media. After all, governments, charities and religions all want to get their message out there. Dan Pallotta (2013) argued in a TED talk for the use of corporate behaviour for a more effective achievement of pro social goals, and so such organisations have just as much justification to use psychology to affect the way we think and feel as the corporations do. This is an advert made by The Church of Jesus Christ of Latter-day Saints to raise awareness of the value of family relationships. No doubt it has a secondary purpose to raise the awareness of the name, brand identity and character of the Church. Today I want to play with the Freudian concept of transference. We see here footage about a new father talking with his father. They had had a rough past day, taking care of the family business as best they could while also taking the mans wife to hospital so she could give birth. The account is moving as it portrays the young family’s dependence on the apple farm, but yet saw it as immaterial compared to the experience of having a son. Finally the father declares that he went in the night and collected the apples in, and the adverts tag line is declared ‘Family… Isn’t it about? Time? For many of the ads viewership, especially in North America, there are a lot of young and closely connected families and many can compare the model relationships conveyed in the ad to their own situation. There is the use of empathy, which is a form of stepping into (or transferring) yourself (as the viewer) into the situation. We already know plenty about how emotions take precedence over rationality in compelling a person to action, and so this ad is evocative. And lest we forget, the purpose of the advert is as much about raising the profile of the Church as it is about reminding people to spend more time with their families. Rifon, Choi, Trimble and Li (2004) demonstrate how brands and sponsorships, which are congruent, are more persuasive. One might argue that the conscientious consumer might interpret sponsorships with distrust towards the sponsor. Interestingly, the evidence from Rofon, Choi, Trimble and Li (2004) supports that such endorsements typically support the credibility of the sponsor, even though and the cause of the relationship is unconfirmed. So there we have it. In this as the Church portrays a pro social message effectively using emotions, and in addition to any motivation it provides with regards to ones family, it also raises awareness of the Church’s name as an organisation that supports families. This is an effective advert because evidence suggests that such sponsorships/endorsements will aid the credibility of the church as well. Consumers aren’t that stupid. They know when they are being up-sold, down-sold, lied to or aroused. If any marketer believes that customers are not remarkably good at second guessing the game which they are playing, they are deceived (Brown, 2004). One way, according to Brown (2004) is to step the cognitive ingenuity up a notch and introduce some irony. Yorkie continues to address its target market of the young, machismo males making statements which, if were to be construed literally would be grossly sexist. But this latest ad edges away from the ‘it’s not for girls’ statement to portray the idea more discreetly. Instead, we now see a guy doing something many guys can relate to. Not content with making two trips in from the car, he endures blistering pain, carrying heavy shopping bags, which rip into the joints of his fingers. If masculinity were the concept being glorified Yorkie would be doing the feminist movement a great favour. If we were to take the situation seriously, the man is laughable. But it plays into a common sarcasm of couples banter, where the man believes he is hard done to and has a tough mandate to live up to, when really he’s doing nothing sensational. This is Yorkie’s brand personality. This chunky slab of chocolate marries macho chunkiness with a food known for its sweetness. It is irony in action, and it is also fun. In mocking itself, irony sends its message through inversion (Brown, 2004). To a market who is well aware of the wrongs of sexism and the futility of exaggeration, irony echoes ‘you know what? We know that too. But we’re still going to have our fun, and you can be a part of it by buying our chocolate’. Irony, however, is not a miracle pill. Deighton (1985) warns that it might destroy an entire market category. Indeed, if your use of irony is not done with caution, you risk presenting your brand unethical, snide or just plain rubbish. In the case of the Yorkie bar, the irony is well portrayed, with the use of curiosity and brand personality. One problem it has is a classic: the brand itself is not memorably portrayed. The ad no doubt will support Yorkie on the recognition line-up, however it might struggle to get people seeking out a Yorkie. This week my attention will focus on the advert for Panda Cheese; a product which, unless your are either Egyptian or an avid You-tuber, you probably will not have heard of. This is a set of ads, which have a common theme throughout, that when a person chooses to reject Panda cheese the pander mascot appears gazing longingly into the character’s eyes before erupting into frenzy and violently attacking objects around the room. It’s interesting, because it creates a brand identity that is both aggressive and unexpected – two factors that I seldom associate with household cheeses. With that in mind, I don’t think that buying it would really be a form of expression. What it is however is different and quirky, so it will more likely make its way into the recognition set of customers in the supermarket. This dark subtle humour (Akerman, 2010) did send the ad viral and so it has a lot of replay value, although a lot of this has taken place in the western hemisphere, so would be of questionable benefit in influence the Panda’s target audience. However the Panda ad does appeal to its target audience regarding the emotional intimacy you build with the Panda. Consider the ‘soft spot’ you feel towards it when it stares longingly before and after its violent outburst. Choi, Miracle and Biocca (2001) argue that cues such as eye contact, facial pleasantness and body orientation create a sense of presence, making (if not the ad) your relationship to the Panda rather surreal. This in turn would create an almost subliminal nudge to cause customers to have some favour for the product. So there we have it. Panda cheese! Viral in the west, award winning in the east (Akerman, 2010) and full of surreal emotion to encourage you to buy.